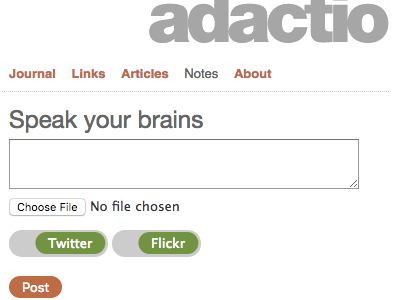 Thank you for reading my journal here at adactio.com. I appreciate your kind attention. I feel should point out that if you’re only reading my journal (or “blog” or “weblog” or whatever the kids call it) then you’re missing out on some good stuff over in the links section. Now it might be that you’re already subscribed to an RSS feed of my links through Delicious. Whenever I post a link to my own site, it automatically gets posted to Delicious too. Despite the assurances from the new overlords of Delicious, the API appears to be kaput. That means my links and my Delicious profile are now out of sync. The canonical source for my links is right here on my own site so if you’re currently subscribed to my Delicious RSS feed, I recommend that you update your RSS reader to point at the RSS feed for my links instead. So feel free to explore the links section and do some URL hacking. There are some great pieces of software out there dedicated to reading RSS, each with their own take on the task. As a Mac user, I’m spoiled for choice with NetNewsWire, NewsFire and Shrook to choose from. But I’ve never found an RSS reader that I’ve been completely satisfied with. I find all too often that the experience reminds of using an email client. Reading email can be an enjoyable activity but more often than not, it’s all about getting the unread count in your inbox down to zero, right? I gave up on feed readers for quite a while and just started reading the few feeds I’ve gathered together at Adactio Elsewhere. But this doesn’t keep track of what I’ve already read. I quite like the way the “favorites”(sic) feature on Technorati works. Here, the freshness of the post takes precedent over the author. Everyone’s posts are mixed up into one river of news. It feels more like reading through a single blog. I didn’t think there was any new way to catch up on RSS feeds until James set me straight. We have weekly Monday morning meetings at Clearleft at which everyone is encouraged to offer up a “lightbulb moment”—an insight or revelation that’s useful or just cool. This week’s meeting didn’t happen until Wednesday (we’re not the best clockwatchers). For his lightbulb moment, James pointed out a nice little feature now offered by Google Reader. If you go to Settings and then look under the Goodies tab, you’ll see a bookmarklet marked “Next” that you can drag to your bookmarks bar. Clicking on this bookmarklet (or favelet, if you will) takes you to the next unread post in your river of news. I really like this way of reading. Like the Technorati solution, the order is determined by date rather than author. But the authorship is very relevant in that you view the entry in its original context; on that person’s website rather than in a feed reader (something that I know a lot of my designer friends have strong feelings about). This little bookmarklet manages to bring RSS reading back into the browser in a completely different way than simply emulating a desktop feed reader. Whenever I want to read something new, I click the “Next” link in my bookmarks bar. I don’t know exactly what I’m going to get but I know that it will something that I haven’t read before, it will be written by someone I enjoy reading and it will be fresh. This solution manages to straddle the fine line between the convenience of RSS (pull rather than push notification) with the tyranny of RSS (a daunting list of feeds to read through). And I don’t need to keep opening new tabs or windows—something that’s hard to avoid with regular feed readers be they on the desktop or in the browser. I’m thinking of creating an OPML file that consists of nothing but del.icio.us links (or quicklinks or blogmarks or whatever) from people whose taste I trust. Then clicking on that “Next” button would have a lovely touch of serendipity, constantly finding something new and fresh, landing me on a web page for no other reason than someone I know thought it was worth bookmarking. It kind of reminds me of what it was like to surf the Web back in the old pre-RSS days before information overload overwhelmed us all. If you’ve got a Google Reader account, give the bookmarklet a whirl and see what you think. 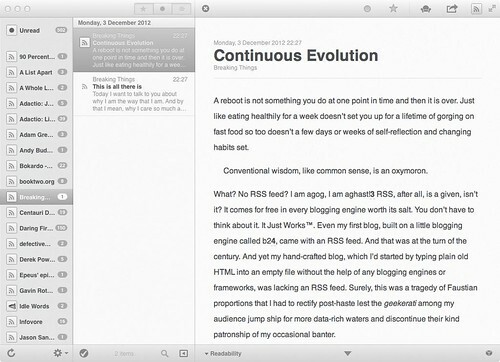 It might change the way you think about reading RSS. I’ve been playing around with Twitter, a neat little service from the people who brought you Odeo. You send it little text updates via SMS, the website, or Jabber. It’s intended as a piece of social software, but I think it has potential for more selfish uses. Every time I ping Twitter, the message is time stamped. Every time I post a link to Del.icio.us, that’s time stamped. Every time I upload a picture to Flickr, a time stamp of when the picture was taken is also sent. Whenever I listen to a song on iTunes, the track information is sent to Last.fm with a time stamp. And of course whenever I blog, be it here, at the DOM Scripting blog or Principia Gastronomica, each entry has a permalink and a time stamp. Just about every time somebody publishes something on the Web, it gets time stamped. Wouldn’t it be nice to pull in all these disparate bits of time stamped information and build up a timeline of online activity? The technology is already in place. Most of the services I mention above have APIs. In this case, a fully-blown API isn’t even necessary. Each service already offers an easily parsable XML file of activity ordered by time: RSS. At the recent Take Back The Web event here in Brighton, Rob Purdie talked about RSS being the vaseline that’s greasing the wheels of Web 2.0. He makes a good point. Over the course of any particular day, I could be updating five or six RSS feeds, depending on how much I’m blogging, how many links I’m posting, or how much music I’m listening to. I’d like to take those individual feeds and mush ‘em all up together. There are a couple of services out there for mashing up RSS. FeedBurner is probably the most well known, but you are limited to a pre-set choice of RSS feeds that you can mix in. RSS Mix offers a more open-ended splicing service but it seems a bit confused when it comes to date ordering. There’s some other service I was playing around with last week but for the life of me, I can’t remember the name of it. All I remember is that it had an extremely annoying interface full of gratuitous Ajax. I’ve mocked up my own little life stream, tracking my Twitter, Flickr, Del.icio.us, Last.fm, and blog posts. It’s a quick’n’dirty script that isn’t doing any caching. The important thing is that it’s keeping the context of the permalinks (song, link, photo, or blog post) and displaying them ordered by date and time. What I’d really like to do is display the same information in a more time-based interface: a calendar, or timeline. Update: Here’s the PHP source code. I’m at an event called Take Back The Web. It’s a cosy little unconference aimed at non-profits and activist groups. There’s been plenty of education and discussion going on all day, mostly around things like blogs, wikis, RSS and podcasting. I followed up the RSS talk with a little spiel about APIs and how they can be used to pull in data from other places on the web. I’m used to attending geekier events where everyone is fairly tech-savvy, but the crowd here is mostly made up of people on the ground who want to be able use technology but who aren’t necessarily from a technological background. It really brought home to me just how far we have to go in making this stuff less geeky and scary-sounding. Just about everyone gets blogs, and it’s pretty easy to get started with them. Wikis are a little bit trickier, but still attainable. RSS becomes harder again: it’s still too hard to subscribe, and even the term “subscribe” is itself misleading, implying payment. As for APIs, that’s still all pretty much rocket science so I just gave a basic overview of the benefits without really discussing the nitty-gritty of programming. Notice how the terms change in complexity along that scale: from the word blog to the term API. We’re using way too many acronyms and technobabble for this stuff. Of course, we can’t change the names without upsetting the geeky programmers. I got a lot of food for thought from the day so far, even though I already know about the technologies. It’s been fascinating to see how people are using the web now and also how much more they could be doing. The guys from mySociety/They Work For You are talking through their services now and I’ve just found about this nifty API. I’ll have a play around with that. I’ll quiz Matthew about it later; he’s staying over with me. More grist for the bedroll.